The Baby Sitters Club was running smoothly until a rivalry business started taking away customers. This series of graphic novels by Raina Telgemeier consist of pictures and speech bubbles versus text, but in this graphic novel, four girls have a problem to deal with. Kristy and the gang are preparing for another great meeting when Stacey feels that she should tell the club why she passed on all the candy that she was offered in so many meetings and how it has been tempting to her. She explains how she has diabetes and that’s why she came to Connecticut. After telling the group, she felt that a “weight had been lifted from her chest,” but that weight was soon replaced. Rivalry companies were taking the girl’s customers because the other groups had older and more experienced girls who could stay out later. Stacey McGill, Claudia Kishi, Mary Anne Spier, and Kristy Thomas knew that they had to do something, but they just didn’t know what until kids started complaining about their new babysitters. From there, the girls had an idea on how to put the Baby Sitters Agency out of business. 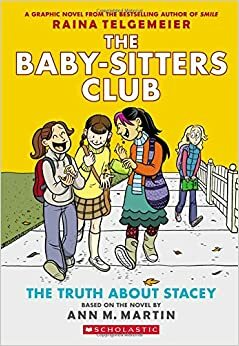 Based on the novel by Ann M. Martin, The Baby Sitters Club graphic novel tells of four girls who run a business that takes care of kids when their parents are busy. It is wonderful for readers that prefer realistic fiction and looking at illustrations to visualise. My recommendation would be to age eight to thirteen readers because of more mature content. Raina Telgemeier tells that when an obstacle is in your way, the best way to solve it is to try to find a solution yourself. Because pictures are used in this book to communicate the main idea, there are less words. Pictures are not necessary in books, but can be an enjoyable way of telling a story. Most of the time this book takes place in Connecticut, but Stacey also goes to New York City. The Baby Sitter’s Club books have their high and low points but overall they are fantastic.